“Capt’n Kenny had a ship, a beautiful one. He would sail the seven seas looking for new lands and discoveries…” On one of his many trips, he tasted a dish called Coconut Shrimp. However delicious as it was, crispy and tender, it wasn’t spicy enough. So he decided to create a version of his own. Capt’n Kenny loves spice. Adores spice. Nothing is hot enough for his tongue. This is great material for another completely different blog post. So, for now, we will go back to this week’s recipe, Spicy Asian Coconut Shrimp. Coconut shrimp most probably originated in the tropics where these ingredients are plenty, and there are many variations to the dish. The shrimp could be battered or just dipped in egg and then coated with the coconut. It could also be butterflied or just peeled and deveined. The coconut could be dehydrated or not. Panko crumbs or bread could be added to the coating. The dish could be served as a main course or as an appetizer. With so many variations, Capt’n Kenny had to come up with the perfect combination of sweet and spicy in his version of the dish and prepared it for you. It is easy and fun to prepare it and you will impress anyone with this delicious rendition. For an even better experience, pair it with a bottle of Italian Prosecco as the Capt’n did on his video. For dipping: Asian Sweet Chili Sauce or any sauce or your liking. New week, new show! 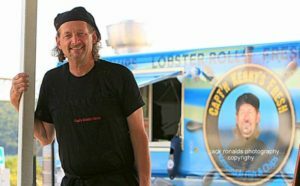 We have received innumerable requests to continue doing our little segments of Capt’n Kenny cooking and sharing his secrets and we thank you for it. This week we are going at it and are working on turning our little segments into a real show with intro and everything. Let us know how you like it by subscribing to our channel. ← Calamari or Squid? Is there any difference?